umm, so those 'new, puffy diamond cables'? yeah, the chart totally calls for them to be knit the usual way. thanks, heroes. 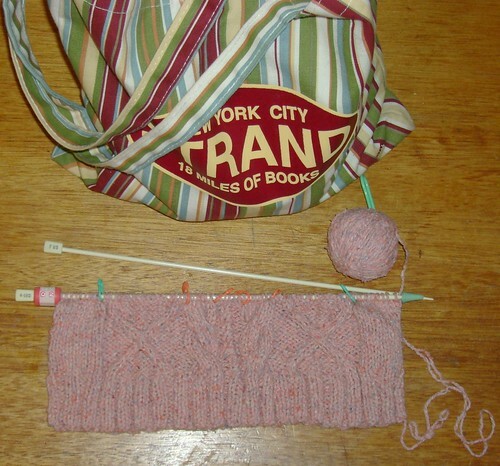 also, if you knit, read this blog. i'd had a tough time of this one at the start because i was trying to follow a new-to-me cable pattern while watching heroes. we are almost done with season 1 (netflix!) and it's so engrossing, it's a bit frustrating to have glance down at a cable chart! so last night, while waiting for b to come home, i decided to download the podcast of last week's this american life and listen to that while knitting (much more successful). b and i had the opportunity to see ira glass in person a few weeks back as part of the USC Arts and Humanities Initiative: Visions and Voices series. he was as fantastic in real-time as he is on the radio. USC had tasked him with speaking about "the arts" specifically, so he came prepared with some really insightful pieces on what to expect upon entering a career in the arts - things like how it can take a long time to become truly GOOD at it (he played a hilarious clip from an interview he gave when he was a budding reporter). he also dissected the show for the audience, illustrating the narrative structure and showing how large a role music plays. it was very cool. beige was having way too much fun taking photos - i had to extract her from the camera! anyway, i wanted to take these before i gave up the sweater so that i'd have something to put with the pattern when i finally type it up. 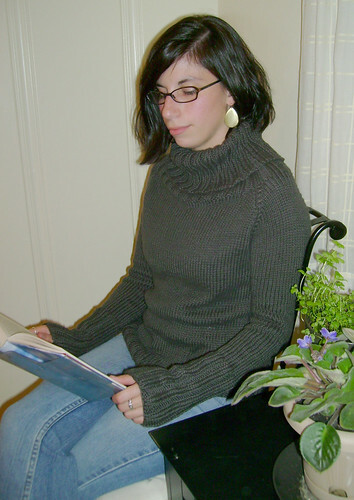 i have to say - this sweater is SO soft and the blue sky cotton is surprisingly warm! i love it! time to finish my teriyaki tofu burger (yum!). yep, that's really a new project on the progress bar on the right - and lack of progress on valpuri. while i was a good girl and finally ripped out the hoodie (yum, rowan summer tweed! ), i didn't get much further than balling it up. i was inspired by everyone's urchin FOs from knitty that i was compelled to knit up a beret of my own. 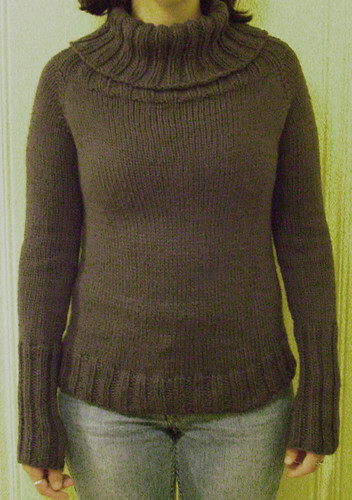 except i desperately needed some cable work; the laura sweater didn't require a whole lot of detail knitting which, being as A-type as i am, i adore. i love ysolda's patterns and had to have this one (bought snow white too - it'll be queued up one of these days)! i couldn't get a photo of my gretel WIP that's color-correct, so you'll have to trust me that it's awesome. i know most knitters don't love variegated yarn with cabling but this piece is so bohemian i decided it would be a good fit. even with the whole bunch of orange that turned up in the middle of the ball, i haven't been disappointed so far! 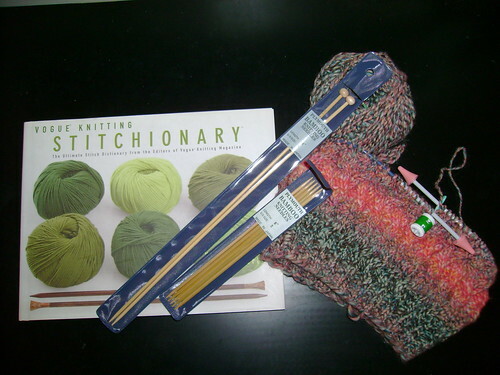 *those would be the gretel yarn (was planning to hit the stash) and stitchionary. you go for needles, you come back with more. save me from the LYS! 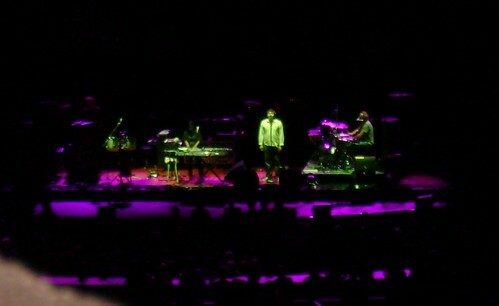 this is lcd soundsystem. i swear. last night i finally finished laura. 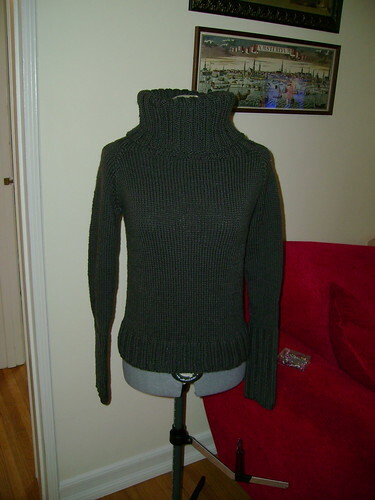 this is a sweater i have been knitting up for a coworker, based on an old discontinued GAP sweater that she adores. i am really happy with how it turned out and it is SO soft - blue sky organic cotton, people. it is amazing! i also spent some time watching heroes and ripping out an ill-fated hoodie. 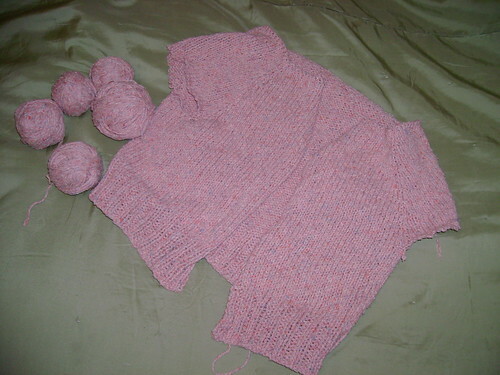 i have GOT to trust my knitterly instincts more; if i think it's going to be too big when i'm knitting it, it's going to be too big. in this case, 'too big' = elephantine. ah well. the yarn is a lovely rose-colored rowan summer tweed and it is going to be repurposed for valpuri, which i hope to start this weekend. tonight, assuming the rain holds off, is going to be a very good night. photos to come! look at that lovely old post down there. it is so lovely and old. 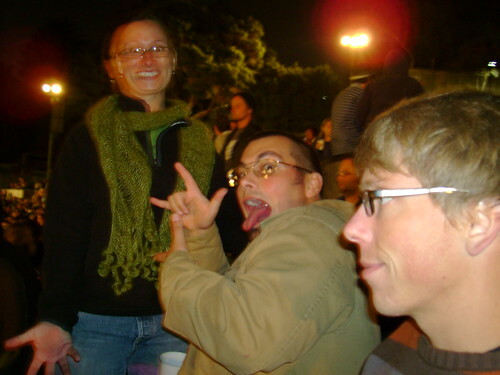 i hate myspace so i'm comin' back. you'll find me here from this point forward! 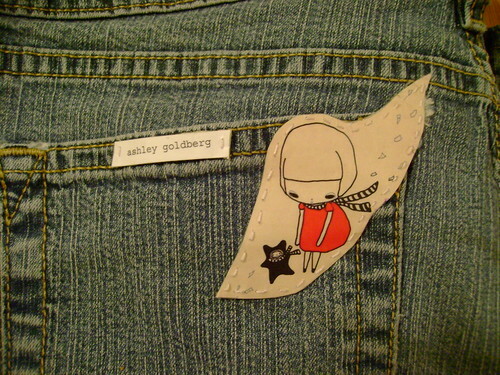 this is a patch i made from a lovely illustration by the very talented ashley goldberg.